This past decade has seen a rapid rise for Smith Vehicle Transport in Co Dublin as it has grown into one of the most successful transport companies in Ireland. Operations Manager Tricia Scannell told more to Irish Trucker when we caught up with her recently. Business continues to grow year on year at Smith Vehicle Transport and for founder and owner Peter Smith the plan has come together nicely, having started up with just one truck back in 2009. Today the company operates a fleet of 15 with its trucks ranging from single vehicle transporters to eleven-vehicle carriers that can carry anything from small cars to large vans. They also have low bed low loaders which can carry trucks, buses, plant and machinery. Smith Vehicle Transport is NSAI Approved and a member of the Irish Road Haulage Association. Its National Waste Collection Permit Licence was obtained in 2013. Tricia Scannell has been the company’s Operations Manager since 2014 and was able to give Irish Trucker the lowdown on the company, its history and the recent move it made to a brand new premises. “We’re based in Rosemount Business Park in Dublin 11 and the company was started by Peter Smith in 2009,” Tricia explained. “He started it up on his own as a sole trader, and over the nine years he organically grew from a transport company to a total vehicle solutions company providing all vehicle modifications, body repairs and storage. Last year we really started to rebrand ourselves, to cover our expanding services and started to trade as Smith Vehicle Solutions. Smith Vehicle Transport has grown rapidly in the vehicle transport industry, with the help of a strong modern fleet, advanced technology and a ‘can do’ attitude. 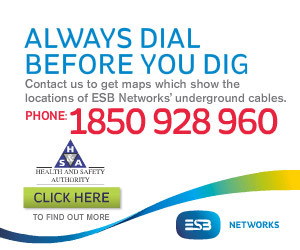 All of the company’s trucks are managed from its Dublin office by their experts. They have a team of three planners who are always only a phone call away to assist in getting your vehicles shipped from A to B. The trucks are navigated by the team using real time GPS Tracking. Not only does this benefit their planners but it also benefits the customer should he/she need to know the precise location of their vehicle at any time throughout the transportation process. The company’s Transport Manager is Adrian McGovern, who has been with Peter since the first truck left the yard at Smith Vehicle Transport back in ’09. “Adrian is our Transport Manager here and I’d like to give him a mention here because he has been a very key man for this company and its growth right from the very beginning,” Tricia pointed out. As for Peter Smith, the industry he chose to start up his own business in is one that he has been immersed in his entire working life. His expertise has seen him manage to build up a company with the help of his added service which can basically collect the vehicle from you in the off fleet condition and return it to your forecourt ready for sale. “Peter was always into trucks his whole life but his real passion was sales,” said the Operations Manager. “Peter started it up many years ago after being asked to pick up a vehicle in the UK when no one else could; he took this opportunity and ran with it. The continued success of the company in the space of nine short years has seen it grow its staff numbers year on year and recently move into a new headquarters and opening a branch in Cheshire UK. “We’ve just moved into these new premises here and took over a state of the art bodyshop in December,” said Tricia. The company’s new base helps them to offer full vehicle solution service. SVS onsite refurb centre team, carry over 60 years of combined industry experience and can offer a cosmetic or mechanical solution for any small or large commercial vehicles. If your vehicle needs midlife attention to keep your vehicle looking professional for your company image or an end of life ‘lift’ to ensure the vehicle is fit for resale. The repairs can be less than the penalty charges that can often be accrued when returning to the leasing company. SVS can remove all additions from signage to electrical installations and carry out any rectification needed. With such a repertoire of services, it’s little wonder why the company’s customers continue to choose them first time and time again. “It’s continually repeat business for us here. A lot of it is on recommendation and word of mouth,” Tricia explained. 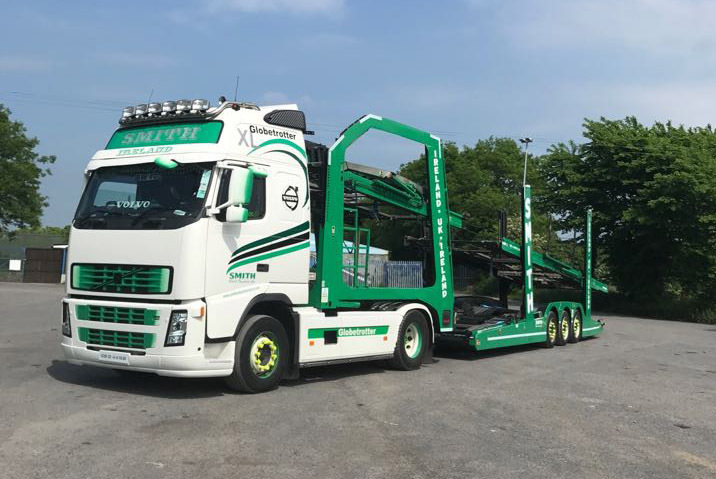 Smith Vehicle Transport have modern trucks and state of the art equipment in its fleet for vehicle transport and with their trained and experienced team you can rest assure that your vehicle is being transported safely and securely. Customers’ vehicles are transported both safely and fast to the company’s depots in Dublin, Cavan, Cork, Cheshire & Northern Ireland or if preferred a destination of their choice. “The fleet is up to 15 now at the minute and he (Peter) always has a variety of different vehicle here – Volvo, Scania, Iveco DAF,” Tricia concluded.